How ironic it is that Stanley Isaacs whom the public housing buildings across the street from Asphalt Green are named for is most famous for fighting Robert Moses in 1956 when Mr. Moses ordered bulldozers to tear up a playground in Central Park to make room for a parking lot. Mr. Isaacs suggested to frantic neighborhood mother that she rally together with local mothers and their baby carriages and demonstrate in front of the bulldozers. Rather than battle dozens of mothers, Mr. Moses had to give up. Today 400,000 children use Asphalt Green every year. The Park is fighting for its survival as Mayor de Blasio wants to bisect the Park with a truck access ramp for a dump, a dump that will be situated right next to the Park and across the street from the Public Housing named after Stanley Isaacs. Children are especially vulnerable to the effects of diesel emissions and can lead to serious health conditions like asthma and allergies and can worsen heart and lung disease. 500 trucks a day idling or crossing a soccer field and infant playground is a recipe for long term disaster. Children already have a higher breathing rate than adults. Children running around and climbing on play structures breathing rate is even more elevated. With each breath a child takes he or she will be breathing in carcinogenic substances. The effects of the degradation of air quality on the children that play at Asphalt Green may not be known for year. We’re more likely to hear of the child who has been struck and killed by one of the 500 trucks turning in to enter the Marine Transfer Station facility. Studies show that there will be 100,000 truck – child interactions will result from building this facility at the entrance of the Asphalt Green. Garbage trucks already strike down and kill more people per year in New York City than any other type of vehicle. Having 500 trucks every day enter a ramp, right where 100,000 children cross a street is a recipe for disaster. Garbage trucks kill 40x the number of people that taxis do. Alexandra Summa of IconicNYC looks into what that means for the 100,000 children that use the crosswalk near Asphalt Green where 150,000 trucks will enter the East 91st MTS being built. Former Governor Mario Cuomo was opposed to building the Marine Transfer Station, having famously stated, "There has to be a more intelligent solution than just saying, "You're going to have a Dump."" Spending close to One Billion Dollars ($1,000,000,000,000) on building and operating a dump makes little sense. We could take half that money and fully fund pre-K for all New York City children. 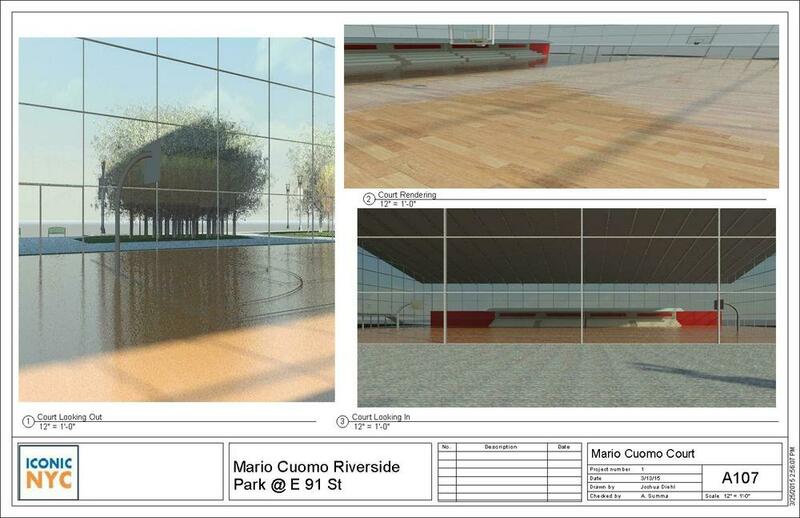 We would still have money to build a park using the existing platform. Wouldn't it be better to have a park in front of public housing rather than a dump? Working with other students Iconic NYC worked to develop Conceptual Drawings on what a park could look like on the existing platform. We named our proposed park for Governor Mario Cuomo for his work in New York State and for his support of the community. 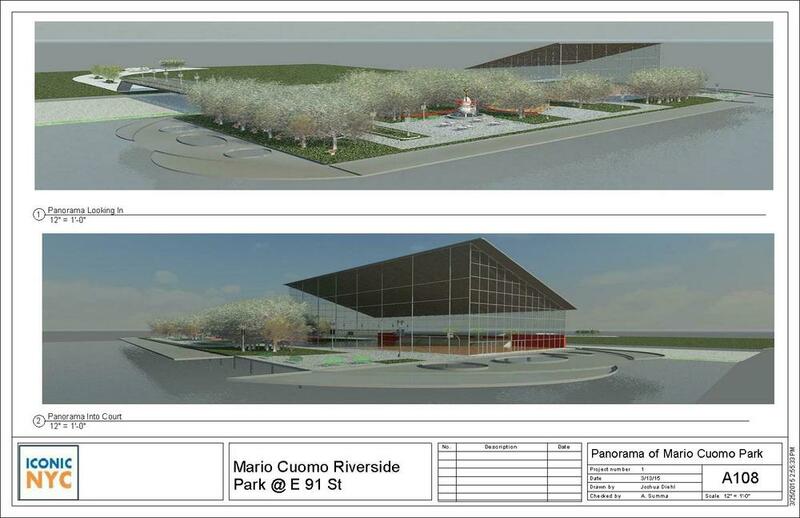 We'd like to think that the Mario Cumo Riverside Park is more intelligent solution.